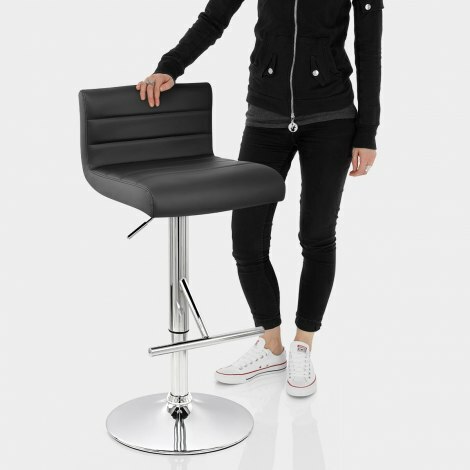 Peerless quality at a jaw dropping price makes the Style Bar Stool Black a desirable prospect, adorning any kitchen bar or breakfast bar with a trendy design that offers superb practicality and easy access. 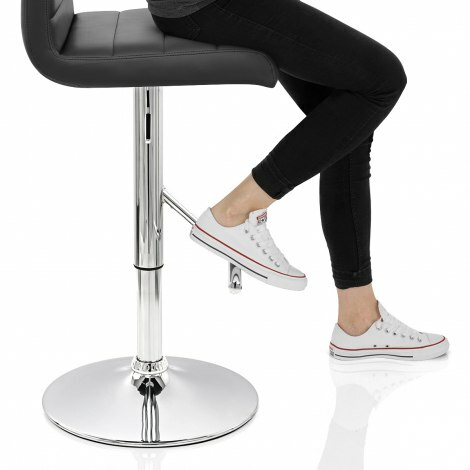 Choose smart simplicity with the Style Bar Stool. The copiously padded seat is comfortable and supportive with dense foam covering its entirety, including the ergonomic, supportive backrest. Soft black faux leather upholstery is supple and pliant, with a striking grain and stitch detailing that segments the seat, adding to the visual impact and contrasting with the strong, sturdy steel frame. Plated in mirror finish chrome, this showcases a unique feature T-bar footrest and a height adjustable, 360 degree rotating gas lift mechanism, alongside a rigid circular base complete with integrated floor guard, making the Style perfect for all surfaces from carpet to wood and tile. "Excellent service, quality, comfort and value - 5 stars"
Easy to order. Arrived very promptly. Packaged well. Husband found them easy to assemble. Comfy chairs. Our new bar stools look fantastic, were a great price and great quality. Would recommend the stools and Atlantic to anyone.